I'm still having a rough time adjusting to the new dosage of my medication. But will you help me spin that into something fun? One of the side effects is wacky dreams. Last night I dreamed that one of the Food Network celebrity chefs was in my kitchen. The funny thing is, this chef wouldn't even be on my top ten list of celebrity chefs I'd like to meet! That got me thinking, Who would I like to meet? 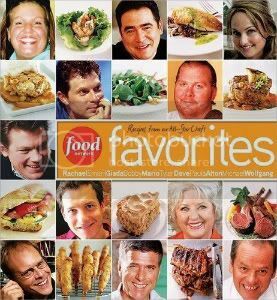 If you could meet any celebrity chef (TV chef, cookbook author, etc. ), who would it be? Why? As long as it wasn't chef Ramsey, I'd be good! and i still want to know how he made that one soup..
Hmmm - I have no idea since I don't have TV and don't know anything about cooking shows or celeb chefs. Too funny about your dream though. i would like to meet alton brown...he can talk human to me! I would like to meet Paula Deen. I think she is a hoot! Oh lord Aarti is kind of fun. Melissa is here from Seattle I would love to meet her, she does some interesting dishes. Paula I think would be a kick in the pants. Duff is amazing Melissa, I would have picked him too! Hubby has weird dreams from his meds and they go along with his moods. Hope things get better for you soon.